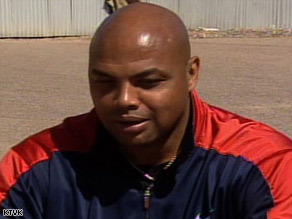 PHOENIX, Arizona (CNN) -- Basketball great Charles Barkley began serving a three-day sentence in Arizona's infamous Tent City on Saturday, jailed by the same sheriff whose autobiography he endorsed 12 years ago. Charles Barkley bristled at the implication he should be wearing stripes instead of a red-and-bue sweatsuit. "You come here when you screw up," Barkley said at a news conference hours after he reported at the Maricopa County jail. "I don't blame anybody for this situation but myself." Barkley, 45, pleaded guilty last month to misdemeanor drunken-driving charges stemming from a New Year's Eve arrest after he left a Scottsdale, Arizona, nightclub. A judge sentenced him to 10 days in jail, but his sentence was reduced in exchange for Barkley's attending an alcohol-awareness course. At the news conference, Barkley sat next to Sheriff Joe Arpaio, the self-proclaimed "Toughest Sheriff in America." Arpaio is known for giving inmates old-fashioned, black-and-white-striped uniforms, making some of them live in tents and reinstituting chain gangs, even for women. "I'm an equal incarcerator," Arpaio said of Barkley, who will be sleeping in one of the tents. "We don't discriminate." He said Barkley has been "a gentleman, cordial." "He's taking his medicine," Arpaio said. "I hope that something comes out of this." "I wish both of them the best, but it's never acceptable to hit a woman. Period," Barkley said. Barkley wore a red-and-blue sweatsuit, not the black-and-white stripes that other inmates -- who watched the news conference through a chain-link fence --were wearing. Barkley said it's because he's on the jail's work-release program, and bristled at questions about it. "None of the work-release people do that," he said. "But if y'all really, really want to put me as low as I can go, I can do that and make you feel better. "I know when [someone is] famous, you like to see people humiliated." Arpaio, who joked with Barkley over the pink underwear he routinely issues inmates, held up a copy of his 1996 book, "America's Toughest Sheriff." On its back cover, alongside endorsements by Limbaugh, Arizona Sen. John McCain and others, is one from Barkley. "This man, Sheriff Joe Arpaio, is a role model for all Americans," Barkley wrote in the blurb. Barkley is a basketball commentator for TNT, which like CNN is a Time Warner company. A star for the Philadelphia 76ers and Phoenix Suns, Barkley was named the NBA's Most Valuable Player in 1993 and inducted into its Hall of Fame in 2006.